To all who currently serve in the Foreign Legion, to the veterans of the Foreign Legion, to those who have served in the Foreign Legion throughout history since 1831 and in memory of the 36,000 legionnaires who died serving France….I salute you and congratulations on your 15oth Anniversary of the Battle of Camerone. Bonne fête de Camerone! The first known observance of what is now known as Camerone Day occurred in 1906 and was later annually observed (informally) by various Legion units even throughout the First World War. 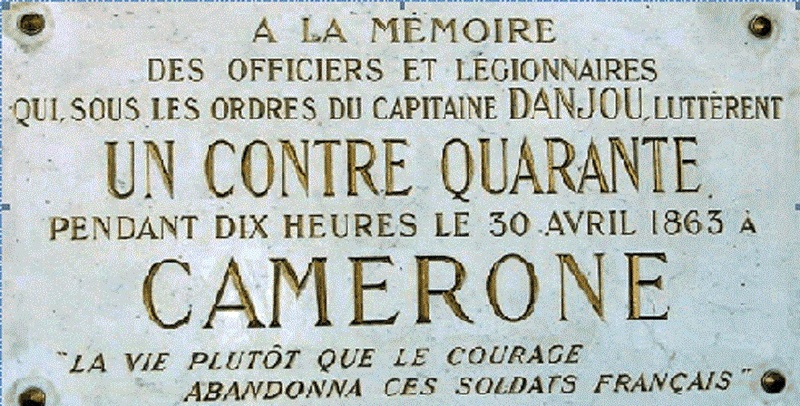 In 1931 (during the centennial observance of the Foreign Legion), Camerone Day was institutionalized as an official ceremony by General Paul Rollet, the Father of the Foreign Legion, as a way to link the “old” Legion with the new Legion and commemorate those men who sacrificed their lives to the Foreign Legion. Each year on this day Legionnaires will recite the famous phrase that is found on the Camerone monument: “They were here less than sixty opposed to a whole army. Its numbers crushed them. Life rather than courage abandoned these French soldiers at Camerone on 30 April 1863. In their memory, the motherland has erected this monument.” The plaque was erected in 1892 on the battlefield in Mexico. The ranking officer will also read an official account of the battle called the Le Récit Officiel du Combat de la Bataille de Camerone. Historical records show that there were 1,020 minor or major battles and sieges during the French intervention in Mexico from 1862–1867. Camerone is one of them. There were actually twenty four legionnaires still alive after the battle–three were still standing and survived the final bayonet charge (Corporal Maine and Privates Wenzel and Constantin) while the drummer, Corporal Lai, was able to escape by feigning to be dead. Many of those captured had been wounded in battle and would later die of their wounds or someplace else in Mexico. By comparison 2,000 soldiers of the Foreign Legion Regiment (Régiment Etrangère de marche) landed at Veracruz and less than half would return home. Over the span of 11 hours, 65 men resisted a force of 2,000 well-trained and well-armed Mexican infantry, cavalry and irregulars, killing 300 and wounding an additional 300. This entry was posted in Camerone. Bookmark the permalink. On the day of Camerone, there is a ceremony in every legion regiment, where one of the lieutenants (nit the ranking officer) recites, by heart, the account of the fighting in front of the whole regiment. Most legionnaires have heard the story but wouldn’t be able to tell it precisely, mostly because it’s in French, and not a simple text. For the last part about the inscription on the monuments, the troops present arms. Interesting fact, Corporal Maine was also present in Bazeilles, another legendary fight commemorated by the French Marines, where they fought to the last bullet.